Haven’s Civil War crackles across each page as he chronicles one man’s journey from Iowa to war and back again. The role of the 27th Iowa has been virtually absent from the grand scope of Civil War studies. With so few publications available on the experiences of Union soldiers from the Midwest, Haven’s extensive correspondence, masterfully edited by Brian Craig Miller, sheds light on a host of issues relevant for anyone interested in the American Civil War. Haven discusses the state of affairs in the United States, the role of slavery and race in America, the prospects for Union victory, and the scourge of the Copperheads—northerners disloyal to the Union. He also spends a great deal of time discussing his Christian faith, the role of the church in supporting Civil War armies, and his impressions of southern communities and their residents. Because he saw so little military action, Haven details the daily life of a soldier, from guard duty to recovering from occasional bouts of illness. He worries about pay, food, getting news, and his comrades. [“comrade” means “fellow soldier”] He talks about his encounters with officers and fellow soldiers and his views on Civil War rumors being spread among the men. Haven also check on his wife and small children through his letters. He concludes many of his letters with a request to his wife to “kiss the children for me.” Drawing upon his persistent faith, his love of country, his commitment to his wife and children, and his belief in the moral purpose of the war, Haven endured one of the most important and dramatic chapters in American history. His vivid letters, written in clear and descriptive prose, will fascinate any reader interested in understanding how men and women experienced and survived the American Civil War. EditorBrian Craig Miller is associate professor and associate chair of history at Emporia State University, where he teaches courses in the Early Republic, Civil War and Reconstruction, African American history, and memory in history. Miller is coeditor of the Kent State University Press series The Civil War Era in the South and Editor of the journal Civil War History. His publications include Empty Sleeves: Amputation in the Civil War South (2015), John Bell Hood and the Fight for Civil War Memory (2010), and The American Memory: Americans and Their History to 1877 (2008), as well as articles and several book reviews. His research has been supported by numerous fellowships, including a Mellon Fellowship from the Huntington Library and the Ballard Breaux Fellowship from the Filson Historical Society. Miller is currently engaged in a study of Walt Disney and Civil War Memory as well as a larger examination of the United Confederate Veterans. Interviews and ReviewsRead a review in The Civil War Monitor. Read a review in Civil War Book Review. 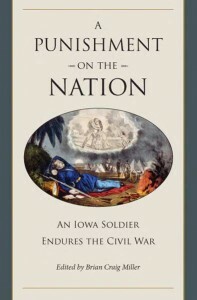 Hear a Civil War Monitor interview with Brian Craig Miller about his work on A Punishment on the Nation. Listen to an Iowa Public Radio interview with the author on A Punishment on the Nation.